My Surface Go has proven its worth since purchasing it last year. 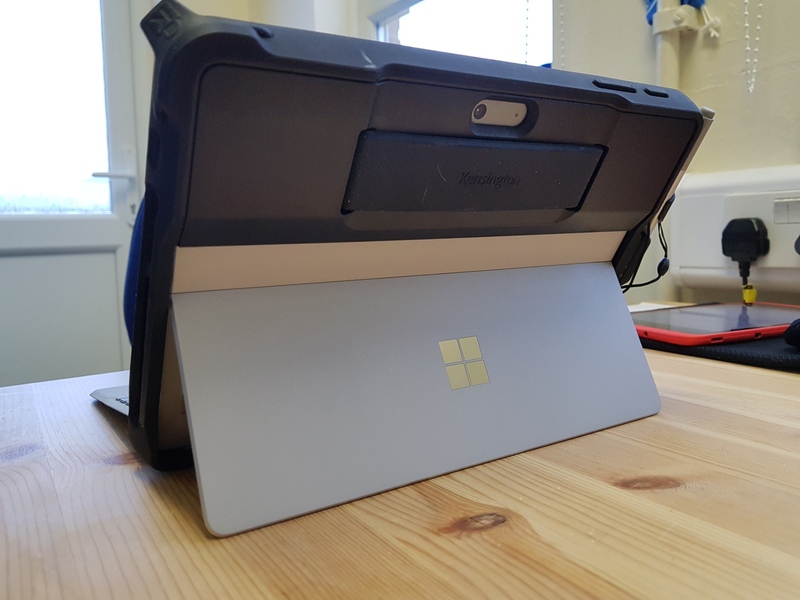 I now have standardised on the Surface Go whenever I am out at a customer site, as discussed before at 1.15lbs its simply the lightest devie to pop in a rack sack and take with you. My Surface Go is now running 19H1 (or 1903 in old money) version of Windows 10, so I can talk about the best of whats coming to WIndows in the future. 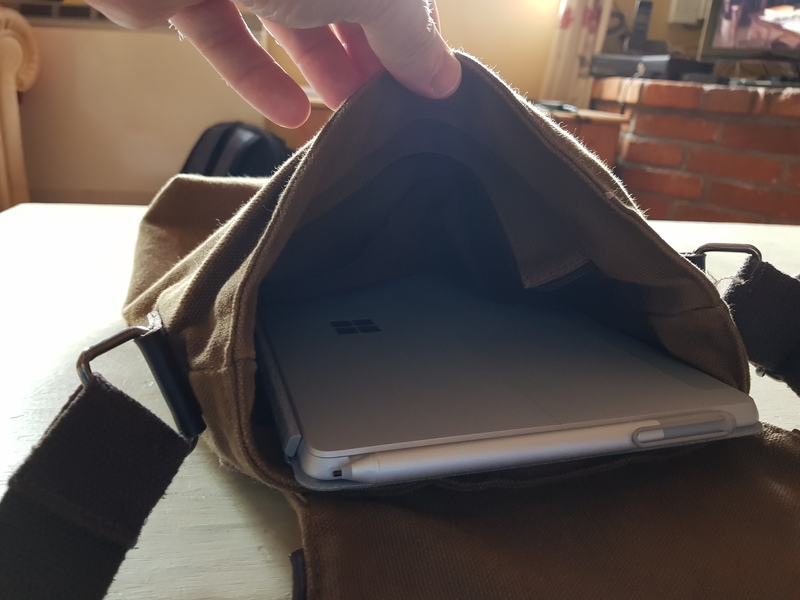 So as I pack the bag today for another client visit, I thought I would take a moment to talk about whats in the bag these days, and how I use some of the new connectivity with apps like Your Phone to get the best from my day to day to life with Surface Go. So the first thing I have done to my Surface Go is to give it some body armour, really to protect from the day to day travels and knocks. So I have invested in a Kensington case for the device. This is great as it does not put to much weight on to the device, and concentrate on protecting the corners of the device in case it should slip out from your bag. I would certainly reomend anyone looking at the device for daily out and about use or even a school looking at 1-2-1 the body armour is eesential! 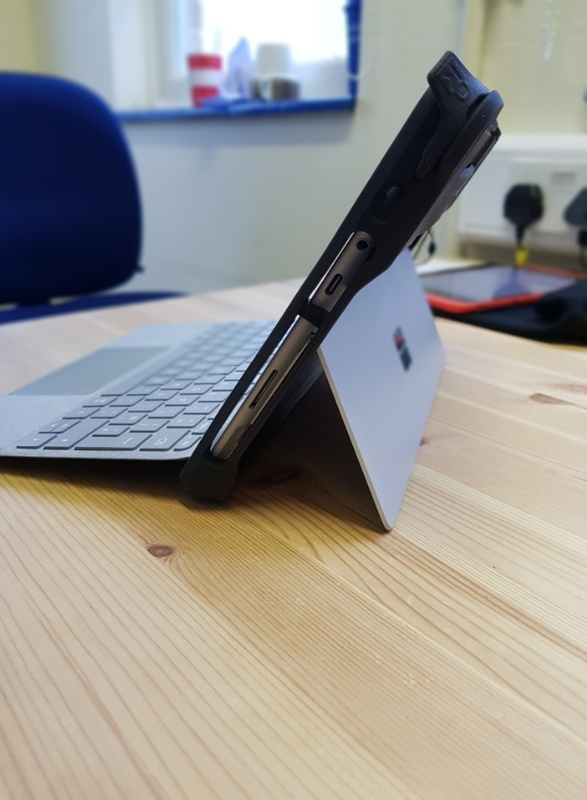 The other greay thing about the Kensington case is that it leave the kick stand free, so you still get to use all of the Surface Go’s frictionless kickstand to get the best angle for use. The case also has a pen holder for the Surface pen which is quite nice as you are not reliant on the magnetic strip to keep your pen close to you ! The only down side I have found with the case is the power connector, which can now be somewhat of a tricky operation to connect, event though its magnetic! However a small price to pay in comparison to a new screen ! Now of course you may be aware that Surface Go has a USB-C connector, which can connect you to a massive list of accessories. You can even charge your Surface Go via the USB, this is really handy if yoiu are travelling light and you only have your phone charge with you. To use USB charging on the Surface Go, you need to have a charger that kicks out at least 15 watts of power, likewise if your looking to charge from a battery pack, you really need to ensure you have a USB-PD pack and cable, this will enable the Surface Go to ‘Fast Charge’ from the pack . USB-PD stands for Power Delivery by the way ! The main adpater I plug into to USB-C is a USB-C to HDMI connector, allowing me to connect to HDMI displays (£34.99 from all good Microsoft Stores). This makes it easy to simply connect to any HDMI ready source via cable, however on the odd occasion where a cable doesnt reach etc I also carry a Microsoft Wireless Display Adapter ! (Please remember to make sure that you keep your adapter firmware up-to-date). 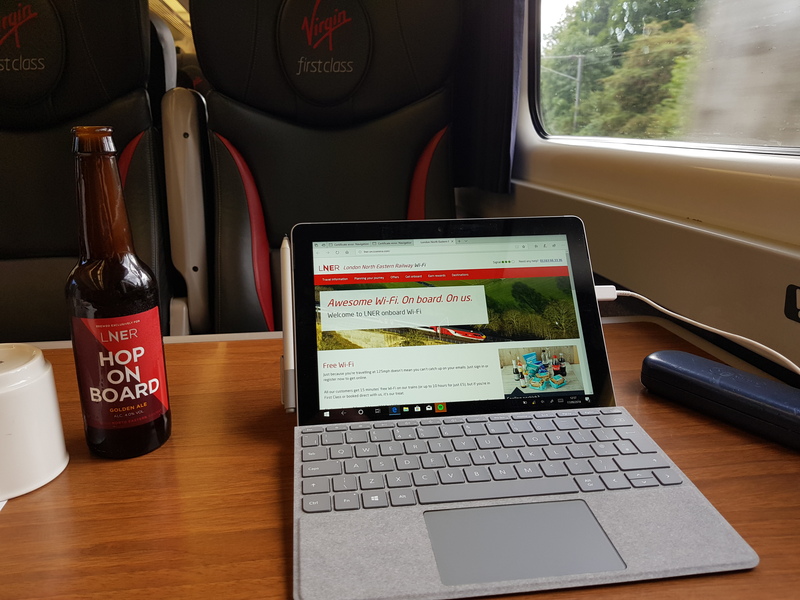 So thats what I take with me on my travels, however with the bi-annual updates to Windows, its the functionality that truly allows me to achive more with my Surface Go. I have been an Android user ever since my trusty Windows Phone was put into retirement. Currently I am running a Galaxy S8 device, but I connect that to my Surface Go with the Your Phone app. Your Phone was part of the 1809 release of Windows 10 and allows you to connect to your Andorid phone and retrieve the last 20 photos from the device and also send and receive texts. So frequently when I am travelling on the train, I can text directly from Surface GO, sometimes I will leave the phone in my bag. To setup Your Phone simply launch the app from the Start Menu, follow the instructions to text the link to your phone and then download the companion app on the Android device and you should then be linked. Where next for Your Phone ? Well you may have caught the latest version of Your Phone now supports Android screen mirroring. This means you can see your Android phone screen and use directly in the Your Phone app. So using any of the Android apps ie Snapchat (if you need to) to booking your next hotel for your business trip can now be completed on your Surface. Note this is not running the app natively in Windows (however I suspect that may be in the a not to far distant release) but simply mirroing the screen, but its a great start in the world of truly mobile working accross devices. With the next version of Windows 10 just receiving the finishing touches, I would also recomend the new Office webapp, which is a part of the new build. 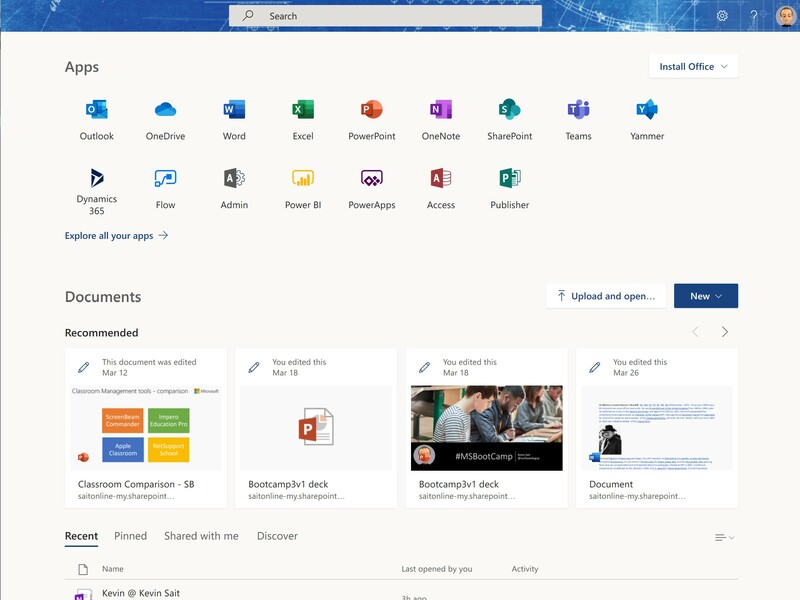 This Progressive Web App, connects you through to your Office 365 subscription in one click. Its incredibly useful as it gives you a great summary of where you are in the day. Office PWA opens your world ! Select from your favourite apps, online apps and documents from one screen. You can customise this space to meet your needs and requirement. Its a great imporovement on the previous version and is coming in the 1903 release of Windows 10. Have you ever sat on a train, looked around you and seen everyone with there laptops tapping away on Excel for example? Well this is the world of mobile working that embraces the highest paid office exec to first line worker. 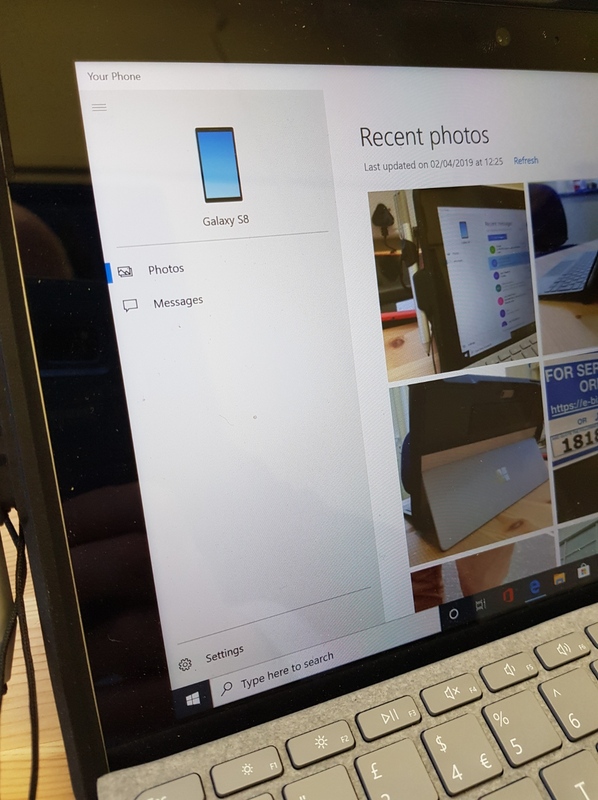 However devices like the Surface Go empower this at an affordable price by giving you more functionality with Windows 10 and the power of the Microsoft Cloud. Surface Go has truly established its place in the modern workers rack-sack of life. I am now using the Surface Go as my out and about machine. Listed above are just a few things that fine tune my working experience, but at the end of the day I have a full blown PC, which is extremely powerful when paired with the Microsoft Cloud for the Modern Workplace. Take a look at Surface Go in the Microsoft Store – if your a student sign in with your EDU account to receive a student discount.